I will be flying delta JFK to Adelaide with a LAX layover. the layover is 1h and 42min. Once I get down at LAX, will there be signs that tells me exactly where to get the airside bus from ? I will be landing in T2 or 3 and then will have to go to TBIT. my bags will be checked all the way thru. Also, does anyone know which departure gates Virgin Australia normally departs from TBIT? I am trying to look at the airport map and see how far I have to walk once the airsidebus drops me at TBIT. This is my first international trip and am travelling solo. Not sure if I made a wise decision but will definitely be a learning experience. Thanks. 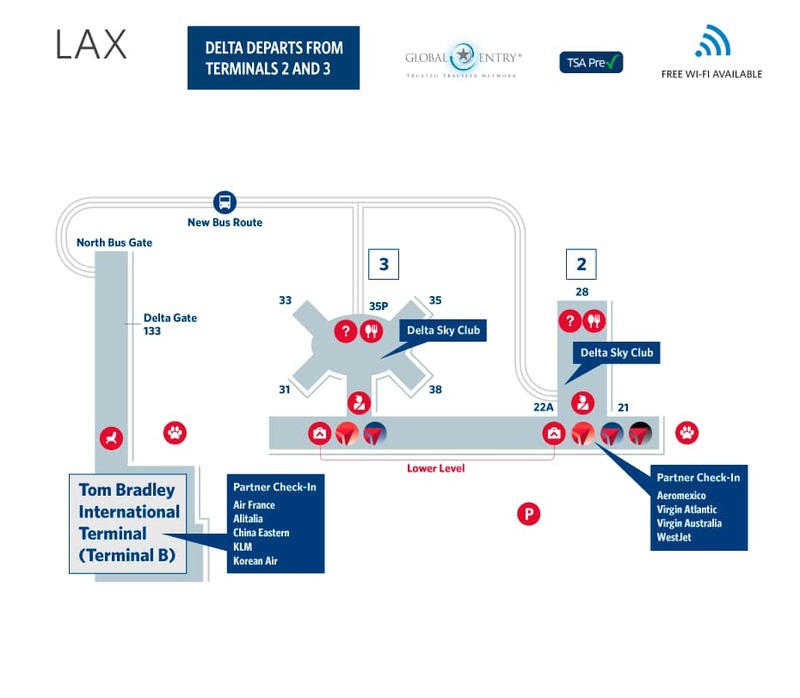 From Delta's website, it appears that the shuttles from T2 and T3 depart from near gates 22A and 35P (respectively). There will almost certainly be signs to guide you there, but knowing what to expect might help you know what to look for. The exact departure gate may vary from day to day, and unusual circumstances might lead to your flight leaving from an unusual gate. Even if somebody on this site tells you what gate the flight leaves from, that information may be wrong on the day you travel. However, there will be monitors all over the airport telling you what gate each flight departs from. In my experience, at US airports, they're usually sorted A-Z by destination (whereas, in the UK, they tend to be sorted by departure time), so it's very easy to find which gate you'll be flying from. Note that many international flights are what are called "code shares". That means that the flight has multiple flight numbers, corresponding to the different airlines that sell tickets on that plane. So, for example, your flight might have one flight number for Virgin Australia, another for Delta and maybe more for other partner airlines. The monitors often don't have space to display all the flight numbers at once, so they typically cycle through them. And you can always ask for help. If you can't see anyone else to ask, just go to a random gate where there's a member of staff who isn't dealing with any passengers at the moment. They'll be happy to help you or direct you to somebody who can help. Not the answer you're looking for? Browse other questions tagged connecting-flights lax delta-air-lines virgin-australia or ask your own question.